Every so often, we get a request to duplicate a database for one of our customers using an Oracle Database Appliance (ODA). The process for doing that is relatively straightforward, but there are a couple of nuances along the way so I thought I’d write it up as a blog post in case it’s of use to others. Obviously, I have obfuscated any customer-specific information to protect their identity. “We are creating a new environment which needs a new database to be set up. Please copy P1_SRV_T and restore as P1_SRV_F”. I spend quite a lot of my “non-contact” time thinking about boundary cases, feature collisions, contention issues, and any other things that could go wrong when you start to implement real systems with (new) Oracle features. The benefit of doing this, of course, is that when I’m looking at a client’s system I can often solve problems because I recognise symptoms that I’ve previously created “in the lab”. The strange thing about this is that there have been times when I’ve pushed Oracle to a breaking point, documented it, and then dismissed the threat because “no one would do that in real life” only to find that someone has done it in real life. In a previous post I’ve listed several free online services which run an Oracle XE so that you can test your SQL easily. You may want use Oracle XE further, with full access to the database and its host, and still from a web browser. You probably have a Google account. Then you also have a Virtual Machine on the Google Cloud (0.5 vCPU / 1.70 GB RAM boostable to 1 vCPU / 3.75 GB) and 5 GB of persistent storage (as long as you used it in the 120 previous days). Just try this Google Cloud Shell: https://console.cloud.google.com/cloudshell. 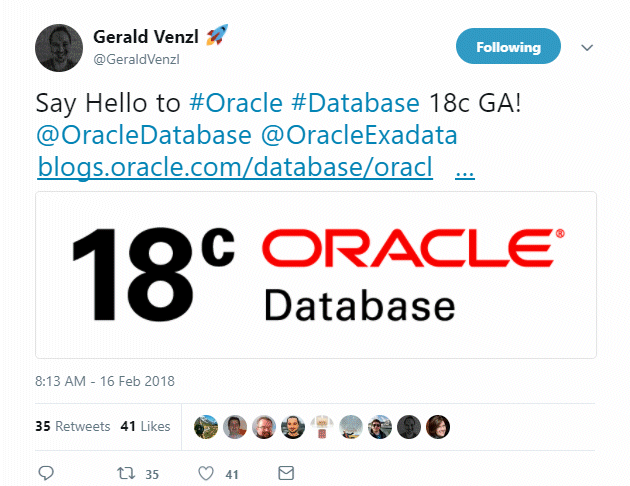 In this post, I explain how to install Oracle XE there. Oracle 18c is out, in the Oracle Cloud, and the first thing I do with a new version is testing how long it takes to upgrade a previous version PDB by unplug/plug. Faster upgrade should be the benefit of having a slim dictionary where the system objects are reduced to metadata links and data links. However, it looks like upgrading the PDB dictionary still takes the same time as upgrading the CDB$ROOT. ODA Lite: What is this ‘odacli’ repository? When ODA Lite was introduced, with ODA X6-2 S/M/L, and now with ODA x7-2 S/M, a new ‘odacli’ was there to manage it. It will probably replace the oakcli for ODA HA as well in the future. One big difference: it uses a repository to record the configuration and the operations. I don’t really like it because when something fails you are blocked. Oracle Support can modify the directory, but they ask for an access to the machine for that and this is not easy in secured environments. Anyway, I really don’t understand why another repository has been introduced. We already have the Oracle Inventory, the Grid Infrastructure resources, the Linux /etc files,… And now we have a closed repository which controls everything, accessible only with the very limited odacli commands which are not the best example of automation code and error handling. I’m recovering after a very successful RMOUG Training Days 2018 and now looking towards the next year. The board elections come up in two months and I’m happy to say, that the goals that I hoped to achieve in my year as president, the board was able to achieve even as I worked on the conference and started as the president for the SQL Server User Group here in Denver, all in parallel. You’ve seen the tweet !! You should always be using Hugepages. They give a minor performance improvement and a significant memory saving in terms of the amount of memory needed to handle the pages – less Transaction Lookaside Buffers, which also means less TLB misses (which are expensive). You are handling the memory chopped up into 2MB pieces instead of 4K. But you also have a single shared memory TLB for Hugepages. So I survived the first day of RMOUG Training Day’s workshops, sessions and the VIP Reception ran a little later last night than we originally planned. I had to present in the first session of the day at 8:30am, so I was a little worse for wear when I checked into my room for DevOps for the DBA. I really appreciate all the attendees that came to the session, the great questions and feedback I received. Its not easy to pay attention to a speaker that early in the morning!